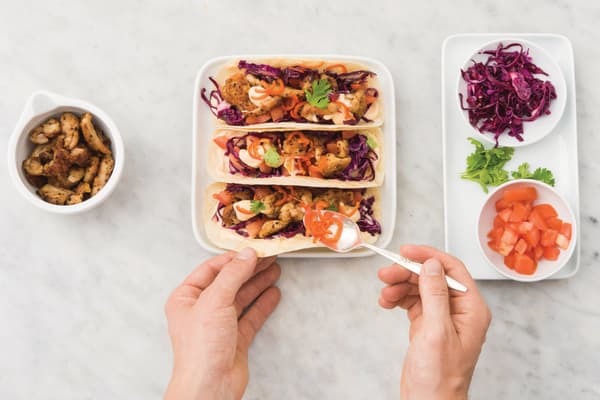 These tacos are bursting at the seams with fresh flavours, but our favourite element has to be the mango mayonnaise that tops off this one-handed delight. Finely slice the red cabbage. Slice the lemon into wedges. 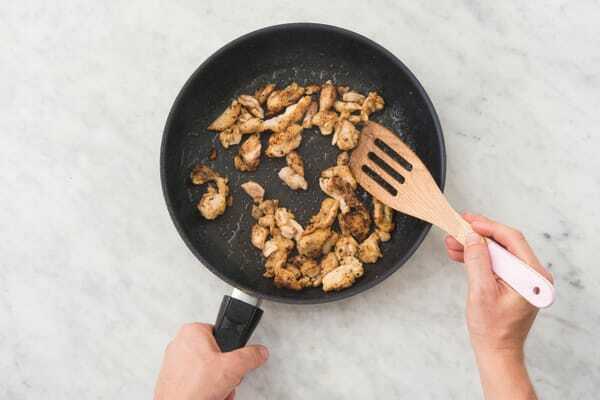 Slice the free-range chicken thigh into 1 cm thick strips. Dice the tomato. Pick the coriander leaves. Finely slice the long red chilli (if using). 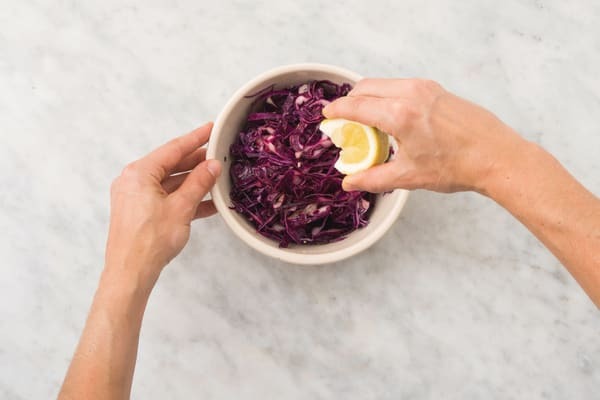 In a large bowl, combine the red cabbage and a good drizzle of olive oil. Squeeze over the juice from 1/2 of the lemon wedges and season with a pinch of salt and pepper. Set aside. 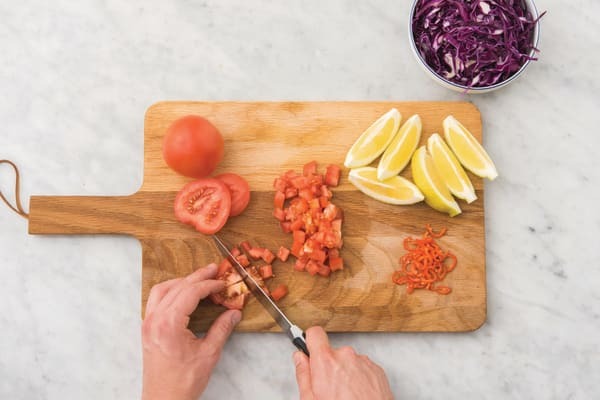 TIP: Adding lemon juice to the cabbage helps it to soften. Place the plain flour, the mild Mexican spice blend and the salt (use suggested amount) in a plastic bag and shake to combine. Add the chicken strips and shake again to coat the chicken in the spice. TIP: Shaking the chicken in a plastic bag helps it to coat evenly and prevents mess. Heat a drizzle of olive oil in a medium frying pan over a medium-high heat. Once hot, add the chicken strips and cook, turning regularly, for 5-6 minutes, or until golden and cooked through. 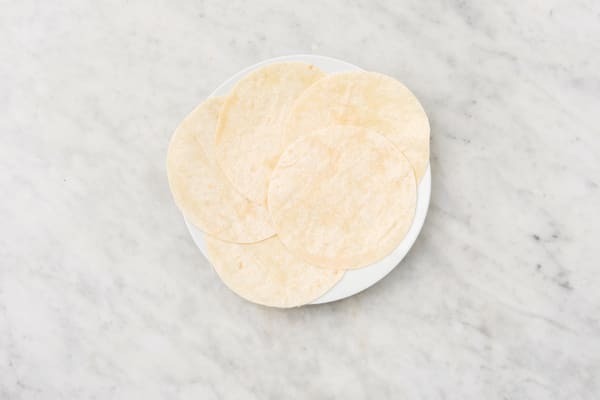 While the chicken is cooking, place the mini flour tortillas in the sandwich press or on a plate in the microwave for 10 seconds, or until heated through. 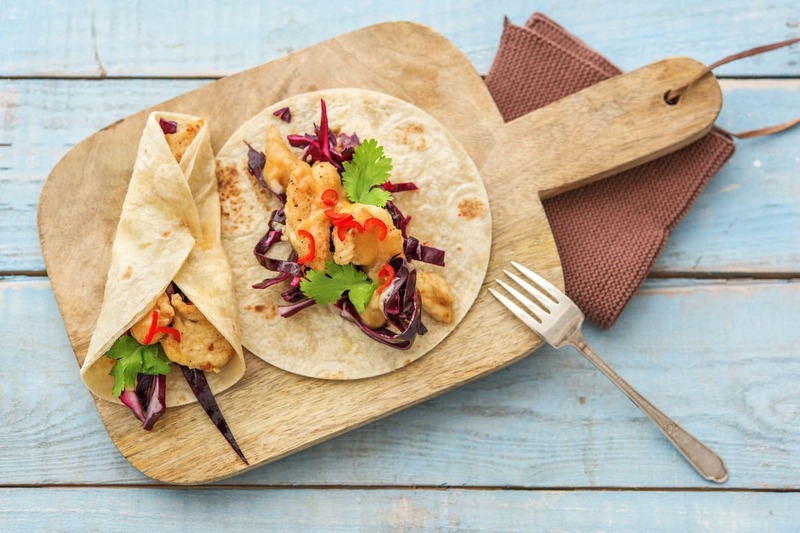 Divide the mini tortillas between plates and top with the cabbage slaw, chicken strips and diced tomato. Sprinkle over the coriander and add a dollop of mango mayonnaise. Top with the long red chilli (if using) and serve with the remaining lemon wedges on the side.